Massive Bull Run 150th Anniversary Wargame in Belgium! My cyber friend Patrick Roovers sent me a link to nearly a hundred photos of a recent wargame the Tin Soldiers of Antwerp hosted for a weekend at their gaming clubhouse in Belgium. I was privileged to have met Patrick in person during one of his trips to the USA, and someday, God willing, I would love to visit his club while a Civil War game is in progress. These mega-games are fascinating and visually stunning in the photos, and I can’t imagine how cool a layout this size must be in person. Well, the battle is over and I finally managed to post the first batch of pictures. Things went very well for the Union, they managed to move two divisions to both flanks of the Confederate army that was still forming. Lack of reinforcements meant that they were desperately trying to hold onto Matthew’s Hill, hoping to minimize the damage. It was a major victory for the Union, and it did shatter the myth of Southern invincibility at our club. One more victory point and it would have been a massive Victory and the Union army would be in Richmond the next day. Here’s a writeup by a fellow clubmember. 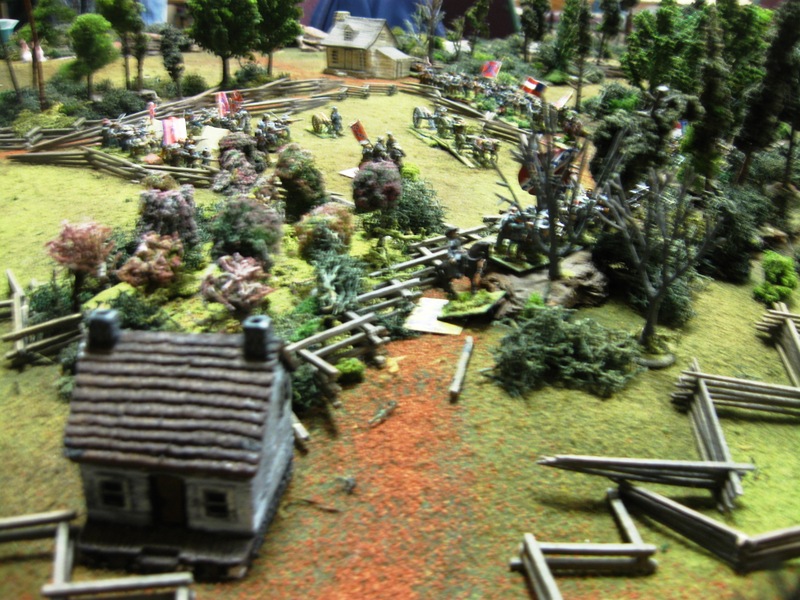 On Friday night at the annual Cold Wars wargaming convention in Lancaster, Pennsylvania, I helped my old friend Jim Kopchak run a 15mm game based on the second day of the 1862 Battle of Shiloh during the American Civil War. 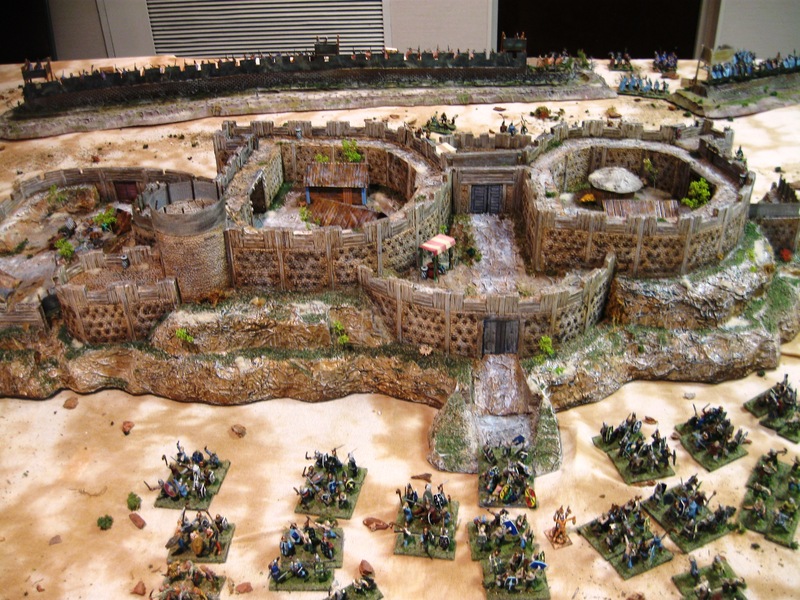 Jim’s visually stunning terrain and well painted figures and battlefield accessories always attract attention from passersby. Jim and I used to game together when I lived in NE Ohio east of Cleveland, and we have in the succeeding years at times tramped battlefields and Civil War sites together. 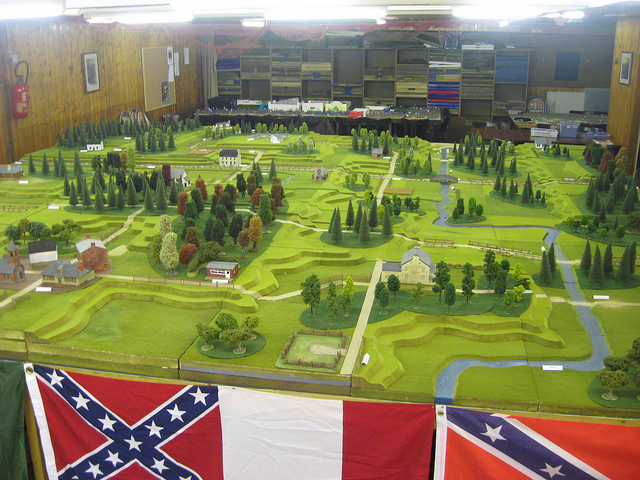 He has published his own rules set entitled Civil War Commander, but at Cold Wars the game he presented used Johnny Reb III as the rules, modified to make it usable for a brigade / demi-brigade basis. The modifications worked, and the game was fun. The Yankees took 2 of their 3 objectives by the game’s end and were declared to have won a minor victory (versus the historical timetable for Grant’s actual success at Shiloh day 2). Here are more photos of Jim’s game. Click each one to enlarge it for better viewing of this very nice Shiloh presentation. 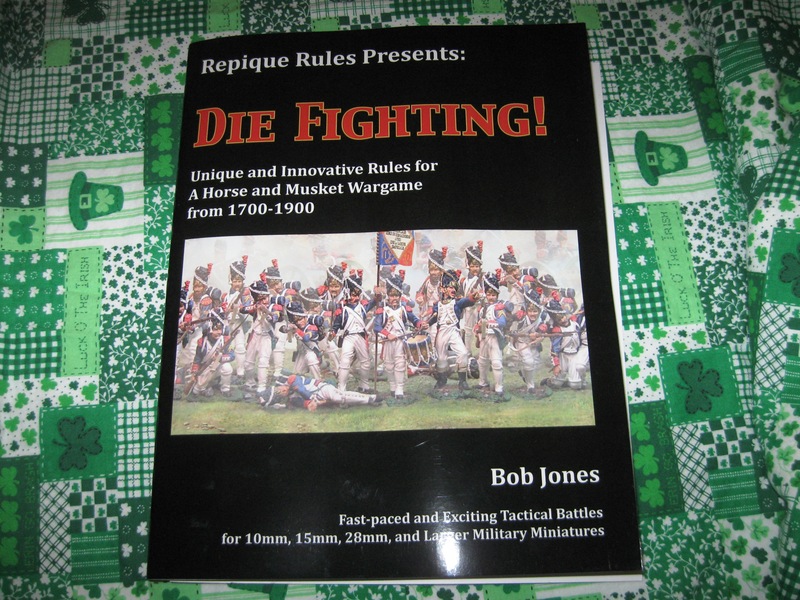 Long-time wargamer and rules author Bob Jones of Repique Rules is back with a brand new rules set that is sure to excite gamers who like the horse & musket period (roughly 1700-1900). This of course includes the popular wargaming topics such as Napoleonics, the American Civil War, Mexican War, Crimean War, American Revolution, Hundred Years War, French & Indian War, the Franco-Prussian War, Spanish-American War, and what Bob terms the Linear Wars (for example, the Age of Marlborough and the Age of Reason). Refighting the battles of Frederick the Great, Wellington, George Washington, Santa Anna, Stonewall Jackson, Teddy Roosevelt, and von Moltke with a single set of rules is a major hallmark of Die Fighting! Each time period has a few unique and simple rules that help add flavor and playability to that particular war. The new easy-to-learn rules are designed for 2 players to small groups, and can be used at home or at conventions. It lends itself to tournament play, campaign play (with statistics), and.or single battles. Solo play is also covered in the rules and should be useful for those times when potential opponents cannot be found as they fear your die-rolling ability. Nothing unusual is required to play Die Fighting! – standard D6 dice, tape measures/rulers, and terrain / figs are all you needs, plus the rules books, simple charts, and events cards. Some random photos I took at the Friday session of Cold Wars 2011. Enjoy! Click each photo to enlarge it. 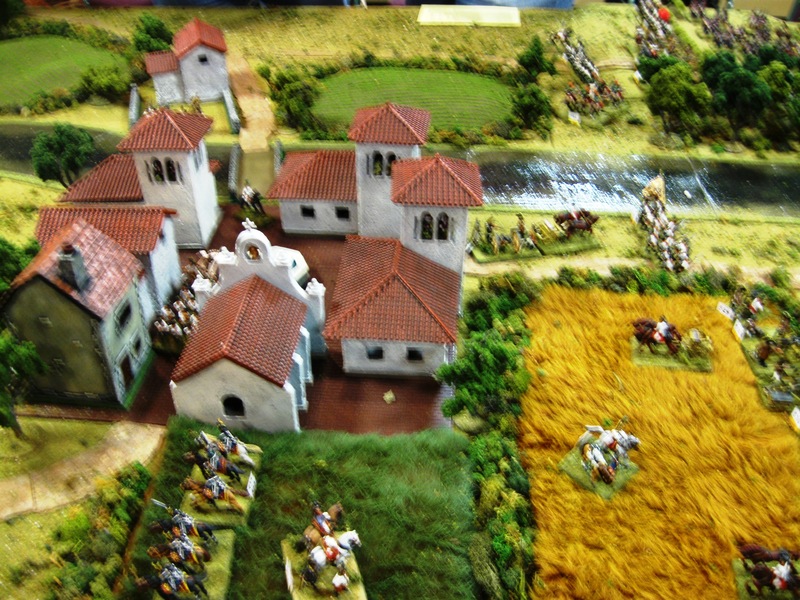 Click to enlarge this photograph of a recent 15mm wargame. 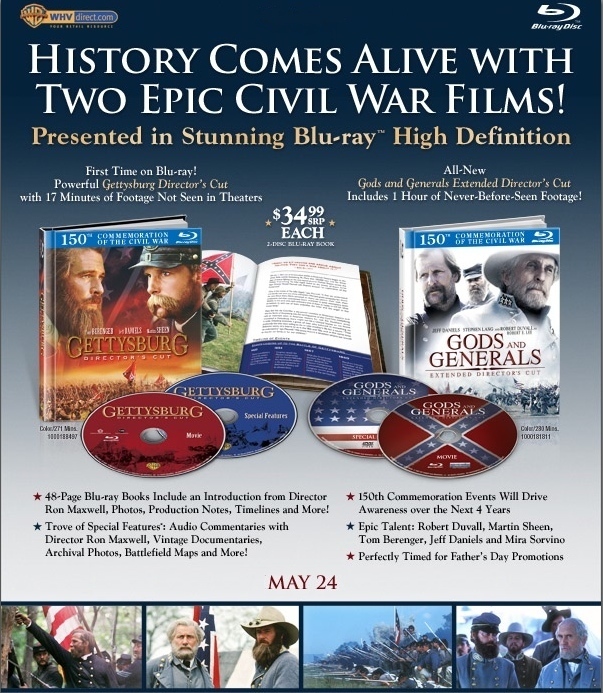 Shaara / Maxwell Civil War movies coming to Blu-Ray. Extended cut. I can’t wait to see these in high definition Blu-Ray – should be very stunning graphics!